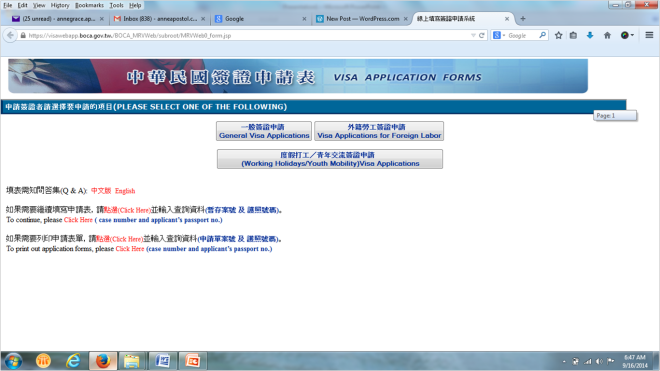 If my special someone was not deployed to Taiwan, I would never thought of visiting the country this early in my life. In my travel priority list prior to him working in the land of milk tea and night markets, Taiwan was nowhere to be found. Today, I have visited the country twice (first time in November 2013 then on May 2014) and currently planning my third one (set on Chinese New Year 2015). Hurray for seat sales! Well, the wanderlust fairy must have something in store for me and I’m just glad that I discovered the many thrills of traveling in Taiwan—lots of unique yet cheap finds, places teeming with culture and tradition, the beauty of nature, one of the most hospitable people in the planet, and the culinary wonders. Oh joy! 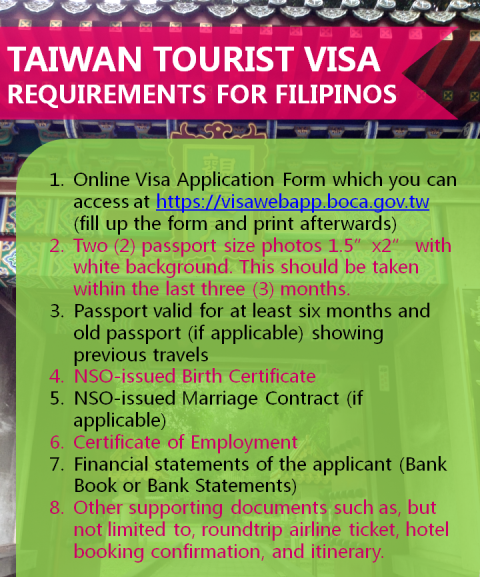 But before setting foot in Taiwan to experience all these, we, Filipinos, have to go through the hurdles of applying for a visa. However, if you are a Filipino holding a valid visa or a permanent resident card from either one of the following countries: U.S.A., Canada, Japan, United Kingdom, EU Schengen, Australia or/and New Zealand, you are one of the lucky ones. Effective August 8, 2013, you are exempted from visa and will be allowed to stay in Taiwan for thirty days. Just register for approval at https://nas.immigration.gov.tw/nase, print out the Authorization Certificate upon approval, and just present it upon airport check-in. STEP 1: Prepare and obtain the necessary requirements. For those travelling on business, there are additional requirements. Check out the Taiwan Economic and Cultural Office (TECO) in the Philippines website for information. You must provide original copies and one (1) photocopy for all documents that would be submitted. There is a possibility that an applicant will be scheduled for an interview. 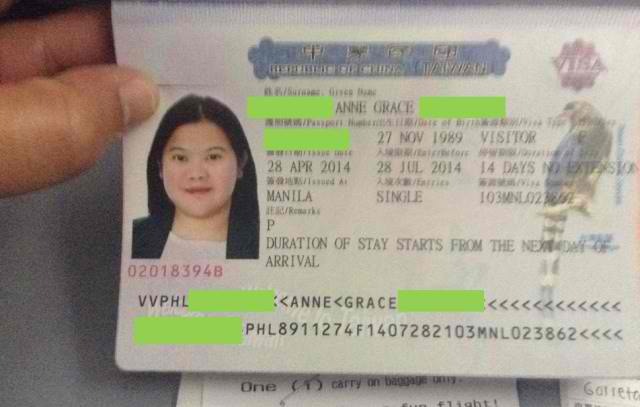 Single entry visa costs Php2, 100 while multiple entry is Php4, 200. Regular processing takes three days. This is non-refundable so if you are denied, say goodbye to your hard-earned money! I submitted all the required documents as well as my roundtrip airline tickets (bought through Cebu Pacific) and my confirmed hotel booking (through Booking.com which I used for visa application purposes only and was cancelled afterwards. Booking.com allows you to book without downpayment.) I also submitted a certification from my employer stating my approved vacation leaves for the trip. The bank certificate that I submitted in November 2013 contains Php80, 000 fund while the one I used for my May 2014 trip has more or less Php50, 000. Don’t think too much about how much you should have in your bank account; as long as it’s enough to support your trip, you’re good. During my second visa application, I had to course it through a travel agency, Spectrum Travel and Tours, as I was managing a busy schedule at work then. Though not listed in the requirements provided by TECO, Spectrum required me to submit an ITR or BIR Form 2316. If you don’t have a copy, this can be easily obtained from your HROD or Finance Department. I paid Spectrum Php5, 000 for a single entry visa application for expedite processing (1 day processing only). 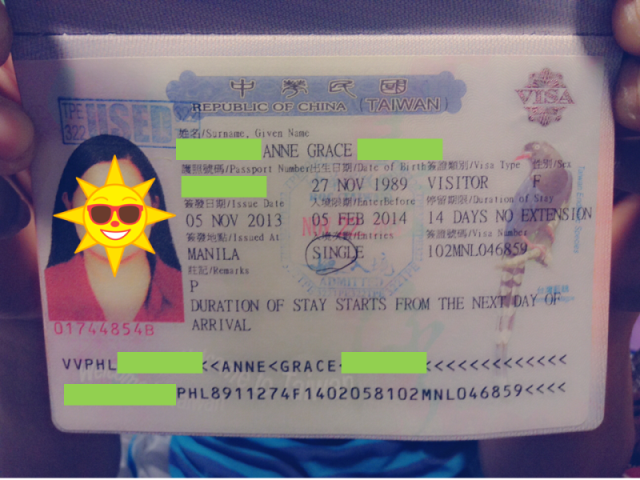 If done DIY, it would have cost me Php3, 150 (single entry visa fee plus Php1, 050 for expedite processing). 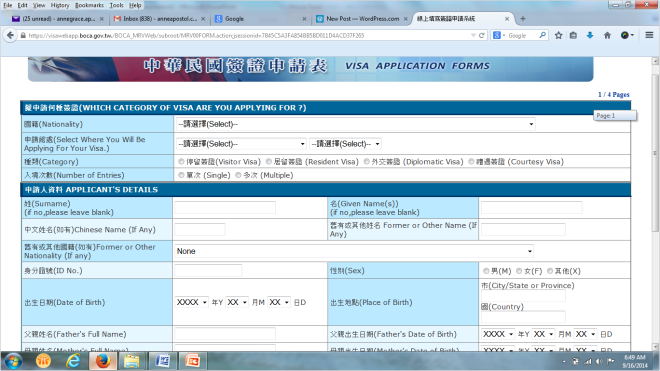 You can access the Taiwan Visa Application Form online through https://visawebapp.boca.gov.tw. Your browser might prompt that connection with the site is 'Untrusted.' Just ignore this and add security exception. This will lead you to the form. You have to fill up four (4) pages and sometimes, the website is erratic which could possibly result in the loss of information you have already inputted. This happened to me and so, I had to click ‘Save Draft’ every 1 minute or so. Frustrating! You must use the drop-down menus and calendars to prevent errors. Make sure everything is filled up and no field is empty. Put ‘Not Applicable’ in fields that you have no applicable answers. Double check all your entries before printing the form out. If you can’t print right after, take note of the applicant number which you would need to access the page again when you’re ready to print. The printed form must be submitted within 15 days, otherwise you have to repeat the process again. 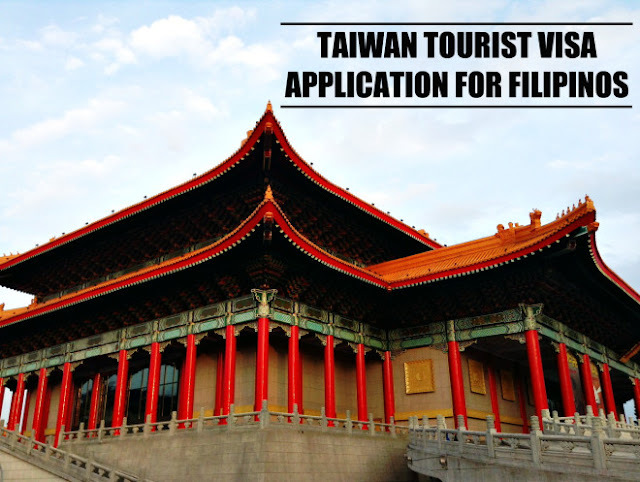 To submit your Taiwan Tourist Visa application, proceed to TECO in Makati City. The office is located at the 41st Floor of RCBC Plaza (41F, Tower 1, RCBC Plaza, 6819 Ayala Avenue, Makati City 1200, Metro Manila, Philippines). For my first application, I applied three weeks before my trip; for the second one, two days before (haha!). The earliest yet safest date to apply is three weeks before your intended travel date. While the visas I got on two separate occasions both have a three-month validity period, I have read that some were given only one month. As we always say, better be safe than sorry. TECO accepts visa applications from 8:45 AM to 11:45 AM, Mondays to Fridays but you can arrive earlier to line-up. However, I went at around 9:30 AM and there were no lines at the lobby anymore. There is no dress code but make sure you look presentable. Otherwise you have to leave another ID and a security fee of Php1, 000. Once you have your pass, take the elevator to the 41st floor. TECO is on the left side upon exiting the elevator. When I went, there were a lot of people, mostly OFWs and agency representatives. Just wait until your number is shown on the digital display board. When it’s your turn, proceed to the indicated window and hand your documents (both original and photocopies; the person in charge got all my original copies). They will keep your passport as the visa will be printed there. After this, wait for the next window to call your name. This is where you will pay the visa fee of Php2,100 for single entry. You will be given a claim stub afterwards. If you have not requested for an expedite processing, you can claim your passport after three (3) days. Releasing of visa applications is from 1:45 PM to 4:45 PM, Mondays to Fridays. You will go again to the receptionist at the ground floor to register, leave a valid ID, and claim your pass to go up the 41st floor. Again, wait for your number to be called, go to the assigned window and show your claim stub. Get your passport to see if you successfully obtained a visa. Lucky me, I was approved twice. Yeeyy! Contrary to what I’ve read in forums and other blogs, the visa I got (on both occasions) were valid for three months and not one month, with a maximum fourteen (14) days of stay. Thank God, you’ve made it! If you have been denied, you can always try again. Good luck and God bless! Fighting! Hello. This happened to me as well and it was very frustrating. Clear your browser's cache or use an incognito window. Otherwise, you have to keep on clicking 'SAVE DRAFT' every 30 or 60 seconds. Sa naka indicate na requirements na kaylangan e submit sa embassy is 3 lang ang meron po ako NSO, Passport and Bank statement na merong 20k + . I was not informed na kaylangan may supporting documents na kaylangan ipasa so that mapprove :( counters asking me for invitation coz our porpuse to there is wedding ng friend ng boyfriend ko! And say po wala first timer po kasi ako ! Bali first time ko po maglakad ng visa :( hindi ko din po naisama ung nakabooked na namin ticket plane and hotel and counter add po na even na mag pasa ako ng invitation chuchu or hindi she cannot tell if i can be approved by china embassy :( nabobother po ako! :( nabaka ma denied po akooooooo :( any pampakalma po please :) pasensya na ! Thanks po Godbless! - Visa Application Form. Address and Phone number in Taiwan CANNOT be blank. You can use the contact information of your booked hotel. - Two (2) 1.5″ x 2″ less 3 months old passport photos, white background, with signature at the back. Extra copy in a plastic attach to the visa application form. Hello, sa upwork din po ako nagwork. Meron po ako lahat ng nakalist mong requirements except ITR, may pag asa po ba ako maapprove? hi. kinakabahan ako baka madenied ako sa pag apply ng visa . i dont have any bank account statement kasi paano yun . Need ko po ba talaga yun ?